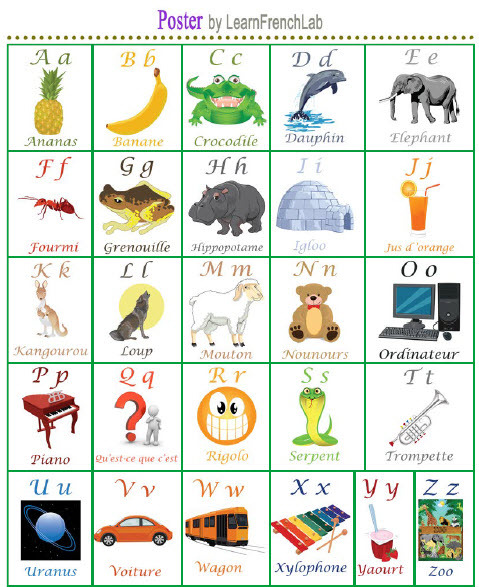 At no point in my college French 101 class did we learn the alphabet. This turned out to be a problem when I got to France and needed to spell things (like, say, my name). The song is an interesting example of how much phonology and orthographic variability we have to get kids to ignore in order for them to learn to read. (That’s equally true in English, of course.) For example: the name of the letter E in French is not even spellable in English. We don’t have the sound at all (and I struggle with it constantly, both in terms of producing it and in terms of hearing it). However, in the song, it’s illustrated with éléphant (elephant), in which it’s pronounced completely differently (like the “long” A in English). The name of G is “zhey,” but the word illustrating G is grenouille (frog), in which the G is pronounced like the G in “green.” You get the picture. le rigolo/la rigolote: joker, funny person; clown (pejorative); also an adjective—funny, amusing, bizarre, weird. le/la trompette: this is an interesting one, as the meaning varies by gender. La trompette (feminine) is a trumpet. Le trompette (masculine) is a trumpeter. le zoo: zoo (but, it’s pronounced completely differently, of course). That’s twelve new words, just to learn the alphabet. Zipf’s Law will get you every time.